Catch a sneak preview of this promo for the Twelve Seventy film before the official screenings. Twelve Seventy produced and directed by Neville Gabie and Dan Farberoff. 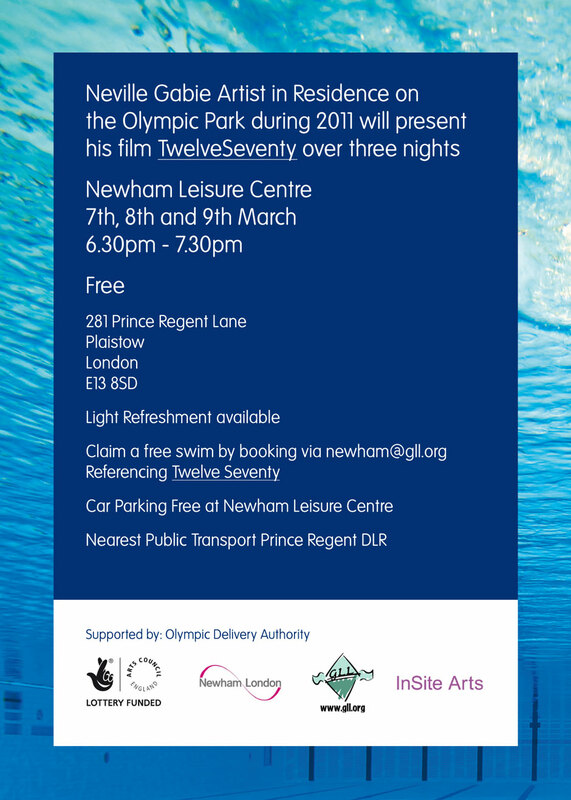 A film created by the Olympic Park’s Artist in Residence, Neville Gabie pays tribute to the contribution of local people in delivering the London 2012 Games by showing a site bus driver swimming the length of her 1.3km route in the Aquatics Centre. The Arts Council-funded piece, entitled Twelve Seventy, gives a personal insight into the ordinary jobs that are as much a part of the story of the Games as the athletes competing next summer. Neville filmed Semina (Sam) Yousef – one of a team of 30 bus drivers on the Olympic Park – swimming the distance of her 1,270-metre route in the 17,500-capacity venue. The distance is equivalent to more than 25 lengths of the 50-metre competition pool. Sam who originally came from northern Cyprus now lives in Leytonstone, East London, and became a bus driver after receiving funding from the ODA’s Apprentice Scheme, which enabled her to apply for a driving licence. She had previously worked as a swimming instructor and lifeguard. Olympic Park Artist in Residence Neville Gabie said: “As just one of the thousands of individuals with their own life stories and reasons for working on the Olympic Park. Sam’s story gives us a snapshot of some of these characters; those people who have all played a part in its creation. They are some of the best known faces of the Olympic Park during construction, the first people you see on entering the site and the last before leaving. Simon Wright, ODA Director of Venues and Infrastructure, said: “Since construction started in 2007, the bus drivers on the Olympic Park and Village have been a constant and essential part of the workforce.